Furberg, a Norwegian scientist working at Birkbeck College conducts research leading to the correct determination of the structure of a nucleotide, in which he sets the sugar at right angles to the bases – later a key element in the discovery of the double helix. 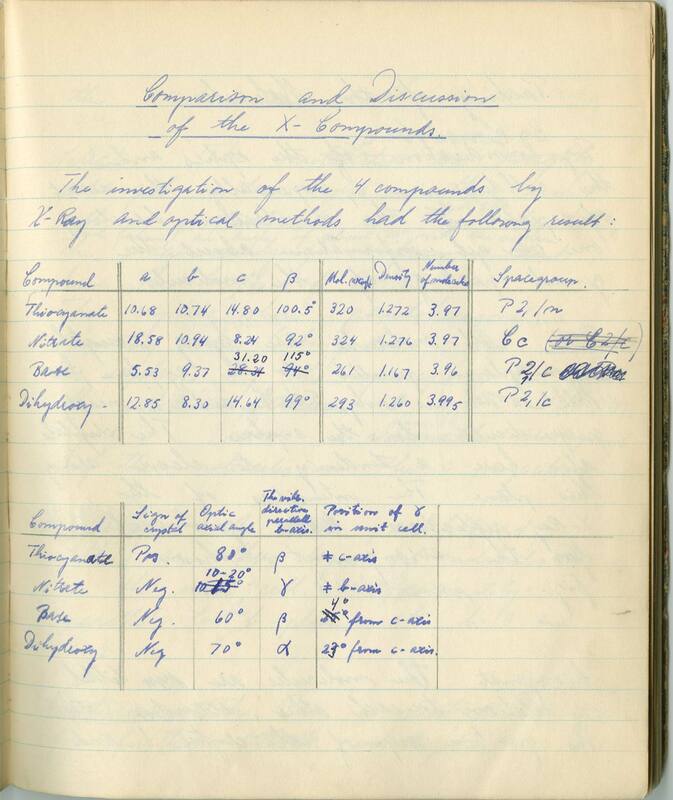 Examples from this laboratory notebook demonstrate his research style as well as the first attempt by anyone to build a model of DNA nucleotides. In late 1952 Furberg’s updated helical model was published in his paper “On the structure of Nucleic Acid” which was one of the few resources cited in the successful model proposed by Watson & Crick in ;Nature April 1953. From the Venter Institute collection on the history of molecular biology (Norman collection). 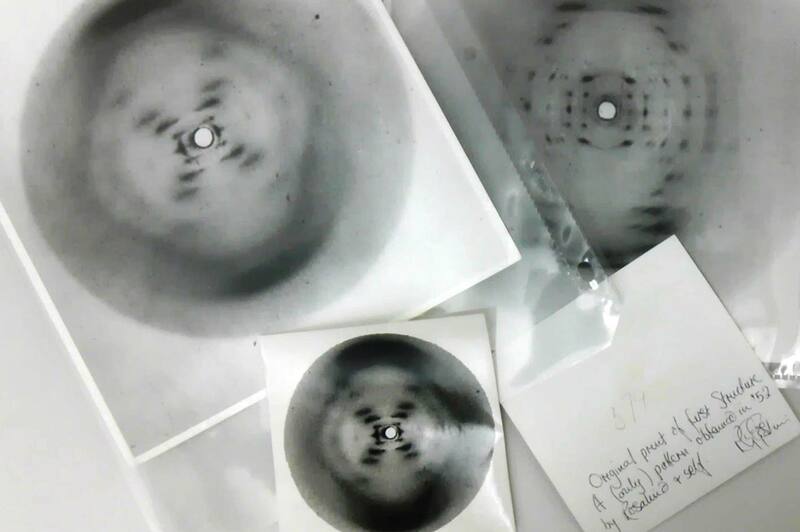 Taken by Rosalind Franklin in May, 1952. The photograph illustrates both the B form (left) and A form (right). Franklin was the first to discover the non-crystalline B form when hydration is increased. This image, shown to James D. Watson by Maurice Wilkins in January 1953, depicts the characteristic X-shaped B form that played a crucial role in the discovery of DNA’s double helix structure. From the Venter Institute collection on the history of molecular biology (Norman collection). Collage of images taken by Rosalind Franklin and her student, Raymond Gosling. This notebook contains 13 leaves of notes in pencil during which time Crick was attempting to prove base pairing experimentally. The experiments, as Crick indicated to Judson in his book Eighth day of creation “were simply just mixing things in solutions and then looking at the way they absorbed ultraviolet light”. 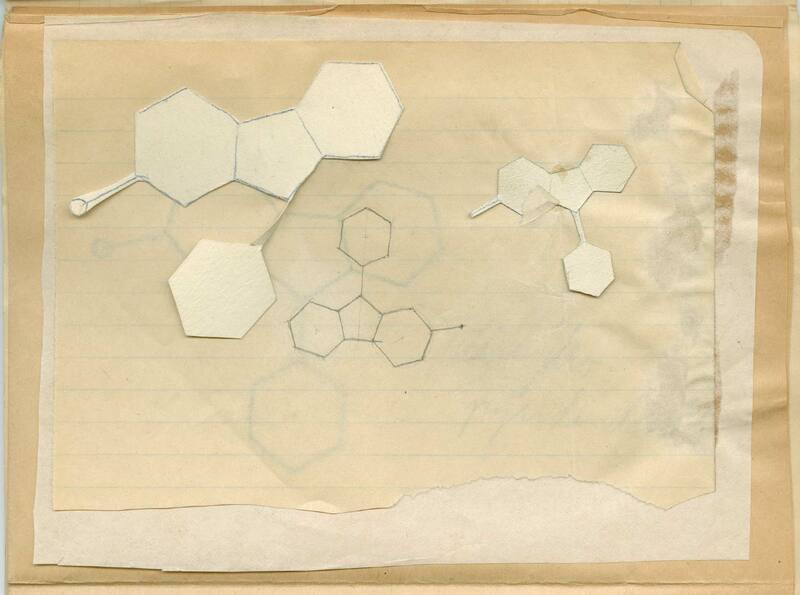 From the Venter Institute collection on the history of molecular biology (Norman collection). This photograph was taken by Franklin’s colleague John Finch shortly after her death in April of 1958. 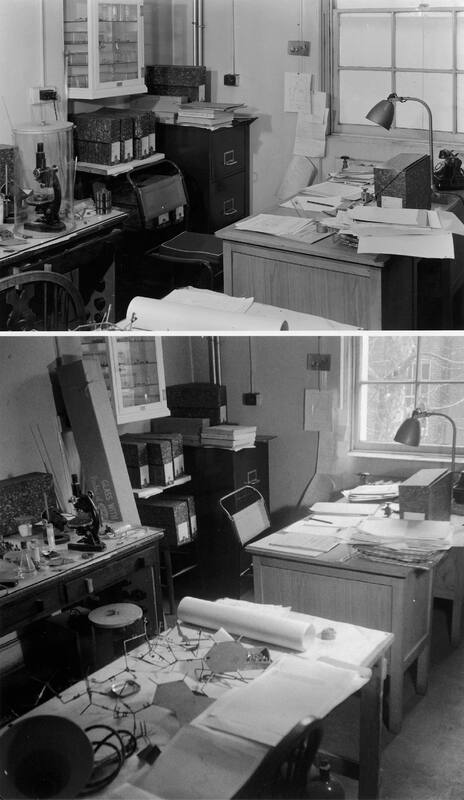 It depicts Rosalind Franklin’s laboratory at Birkbeck College as she had left it. Between March 1953 and April 1958 Franklin led the Virus Research Project where she conducted pioneering work on the Tobacco Mosaic Virus and the Polio Virus. Franklins’ research group included Aaron Klug (1982 Nobel laureate for his development of crystallographic electron microscopy) as well as PhD students Finch and Kenneth Holmes. From the Venter Institute collection on the history of molecular biology (Norman collection). The DBBR was organized in 1977 to respond to requests from Congress and the Administration for information and opinions regarding basic biomedical research. In this image (L-R) Bradie Metheny, Dr. Paul Hopper, Nobel Laureates Renato Delbecco and Hamilton O. Smith, Dr. Mahlon Hoagland, Nobel Laureates Torsten Wiesel and George Palade, and Drs. Warren Hunzicker and George Dunlop speak on behalf of this group. This item, as well as thousands of others are preserved by the JCVI Archives and document Smith’s professional career from his Nobel Prize winning work on restriction enzymes to his most recent work on genome sequencing and the first self-replication synthetic bacterial cell. From the Hamilton O. Smith papers. 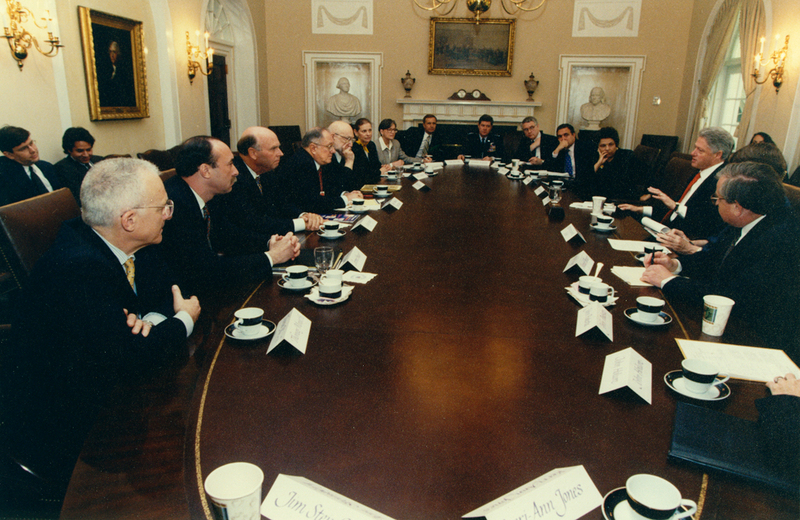 On April 10, 1998 President Clinton lead a roundtable discussion to discuss advances in technology and their potential implications for biological weapons. The President invited the county’s leading experts to discuss with him both opportunities and national security challenges posed by genetic engineering and biotechnology. One of these select invitees, was J. Craig Venter, seen sitting directly across from the President. Also present are Secretary of Defense William Cohen, Director of Central Intelligence George Tenet, Attorney General Janet Reno, Nobel Laureate Joshua Lederberg, among others. Image from the J. Craig Venter papers. The J. Craig Venter Institute Archives includes several notable collections including: The J. Craig Venter Institute History of Molecular Biology Collection; the J. Craig Venter Collection; Hamilton O. Smith Papers; and the Sorcerer II Collection.